In the Mott the Hoople classic, written by David Bowie, we hear that "all the young dudes, carry the news, boogaloo dudes, carry the news." 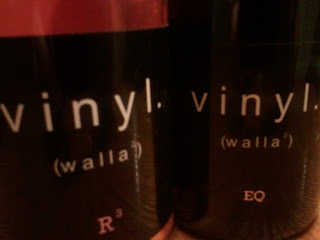 Carrying the news out of Walla Walla comes the "young dude" of Vinyl Wines, winemaker Chip McLaughlin. Chip grew up around wine and the wine industry with his brother Erik holding several posts in the wine industry (currently, Erik is the Director of Wineries at Corliss Estates). That early and constant exposure to the wine industry, coupled with the opportunity to drink some amazing wines has made wine approachable for Chip, more so than it is for many of his generation. Chip and his brother are close and Erik's relationship with wine became Chip's. Wine was automatically cool for Chip growing up because Erik was into it. "I never really saw wine as being stodgy or the like until I got a little bit older." In addition to the the cool factor Chip got to see behind the curtain early on, so he knew that winemaking is not glamorous work. Like anyone starting their own wine label, Chip wanted his to be an expression of his personality. Chip's first love was music and when he looked at ways to make his passions his work, a collaboration between wine and music seemed natural. So Vinyl Wines and its reference to records was born. The Vinyl Wines concept really was conceived when Chip was listening to a new band his friend had recommended on MySpace. (Chip assures me this was "back when MySpace was still cool.") Chip's idea and what makes the Vinyl Wine brand so unique isn't the label, but what's on the cork. Each bottle of Vinyl Wines includes a download code on the cork. By visiting the website and entering your code you can download music by new and somewhat undiscovered bands from all across the country. What kind of bands end up in a wine bottle? Bay area band Spanish Cannons is one. "My initial reaction was "What?! Really?" says front man Chris Michael (no relation to George). "I think nowadays its harder and harder to get attention for your products, be it music or wine or whatever. You have to really do something or say something or create something that stands out among the rest." Chris thinks that Chip has done just that in the Vinyl Wines product and he counts Spanish Cannons among the proud to be involved. "I think Chip really tapped into something amazing and I am excited to see where it goes from here. As far as musically, I hope people can relate in some way. We aren't looking to reinvent the wheel, we just want to create something that people will enjoy and hopefully make a part of their lives, like Chip's wine." So, with such an imaginative concept behind the packaging, does the wine inside measure up? Yes. Chip wants to make a serious wine and with the first releases he's done quite well. Stylistically, Chip wants the wines to be balanced and technically well made. Chip favors wines made in an Old World style and that definitely came through in his Grenache (tasting notes below). "The exciting thing about being in Washington is that the entire industry here is still learning and maturing. I know that it is impossible to recreate what people do in Europe, and that's okay. I just want to make the most well balanced wines that I can with each vintage. Washington is doing something truly great right now and I can't wait until people start comparing other wines of the world to ours, instead of the other way around." What's to come from Vinyl with the next release? Production is growing and while Chip hasn't let any varietals out of the bag, he's shooting for a release to coincide with the Walla Walla Spring release. There's more in store for the musical side as well. If all goes well there's a chance that some fairly well known musicians and bands might show up on the Vinyl corks next time around. For Chip, the idea behind Vinyl was to take away the perceived pretentiousness behind wine without taking anything away from the wine in the bottle or the music that accompanies it. "I definitely wanted to make it something hip," he says. I say he did it. These releases are largely sold out from everywhere at this point, though there might be some Rose lingering in Seattle at a few shops. My words of wisdom for you is to get your hands on some of the 2012 Vinyl Wine releases when they come to market, as there won't be many and they'll go fast. The 2009 EQ-Grenache: From the hip youngster comes an Old World style Grenache with aromatics that are almost Burgundian or Oregon Pinot in nature, dust and earthen characters, violets and dried Montmorency cherries. The fruit for this wine comes from the Walla Walla Valley's little known Cockburn Ranch Vineyard (hold the jokes). It displays an acidity that speaks to that balance Chip mentioned earlier. Red fruits like raspberries, red currants and cherries, and a touch of white pepper leads to the finish. The 13% alcohol says that all is not lost to the big and hot here in Washington. Washington is single-handedly saving the world from bad rose and the 2010 R3 Rose was Vinyl's contribution to the effort. The hue on this wine is a bright hot pink but the aromatics present red fruits across the board. A hint of residual sugar and bright red fruits and rhubarb on the palate make this a summer wine for when the living is easy. The wines were provided as samples.